4 August 1943: Keel laid as DE 751 by the Western Pipe & Steel Co., San Pedro, Cal. 8k Oswald Joseph Gaynier, born 4 March 1915 in Monroe, Mich., enlisted in the Naval Reserve as Seaman Second Class 3 October 1940 and was appointed Aviation Cadet 10 December. Commissioned Ensign 3 June 1941, he was assigned to Torpedo Squadron 8 in Hornet (CV 8) on 25 August. During the opening phases of the Battle of Midway 4 June 1942, Torpedo Squadron 8 launched a courageous attack against carriers of the Japanese Striking Force. Lacking fighter-plane protection and beset on all sides by enemy fighters, the valiant American pilots pressed home the attack in the face of withering antiaircraft fire from a seemingly impenetrable screen of cruisers and destroyers. All members of the squadron but one were killed during the attack. 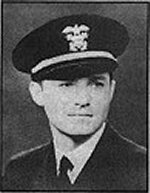 Ensign Gaynier was one of those who so gallantly sacrificed his life for his country and the American victory that followed. For his extraordinary heroism and meritorious devotion to duty, he was posthumously awarded the Navy Cross. USS Gaynier (DE 751) was the first ship to be named in his honor.